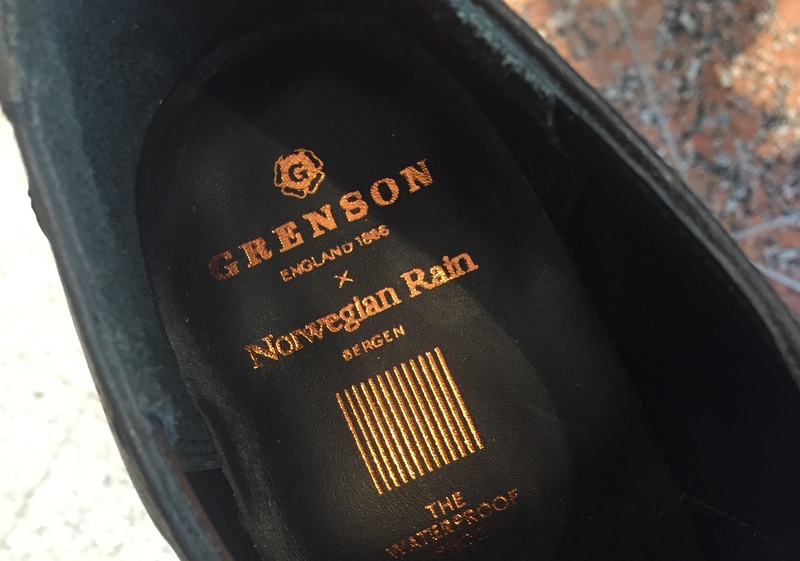 Norwegian Rain and Grenson bring some actual innovation to the traditional British leather shoe - Well Dressed Dad - It is a proper menswear blog. Like, with original words and opinions and suchlike. 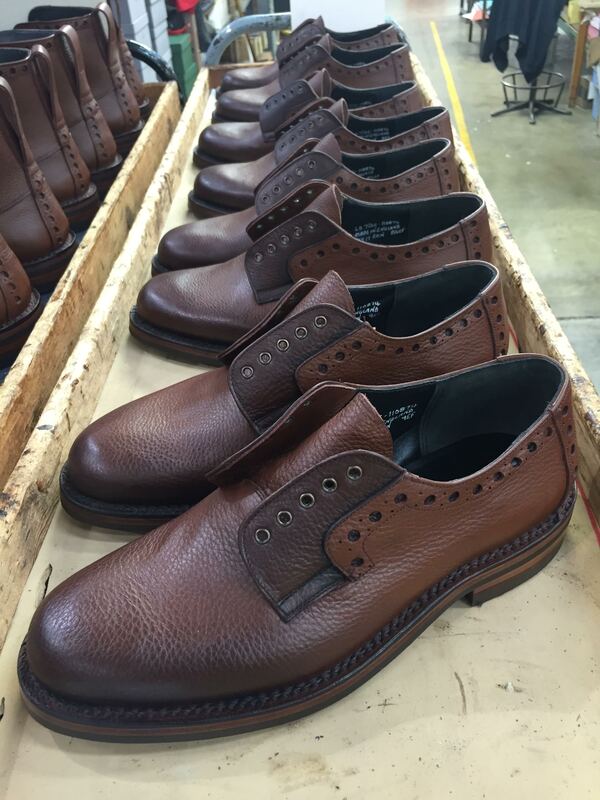 The British shoe industry has a long and glorious tradition behind it. Most of the well known names have been producing quality traditional shoes for 150 years or more, and do a splendid job as well. Goodyear welts, intricate brogue patterns, sublime craftsmanship and basically doing things as they have always been done. Hardly surprising really, as human feet are still human feet, and apart from the vagaries of fashion and taste, the recipe appears to work well. Alexander and T-Michael, darlings of street style photographers everywhere. So how have the upstarts in Norwegian Rain managed to bring some innovation to this genteel industry? Well, Norwegian Rain have successfully established a position as a maker of very desirable raincoats, blending sartorial finesse with advanced Japanese recycled fabrics, based on their years and years of living in Bergen, described by my mother as “intolerably wet” (and she hails from the Midlands so she was born with webbed toes). Living in a very wet place means you either wear appropriate footwear, i.e. something rubber boots or galoshes, or you have damp feet. One solution would indeed be to use galoshes. 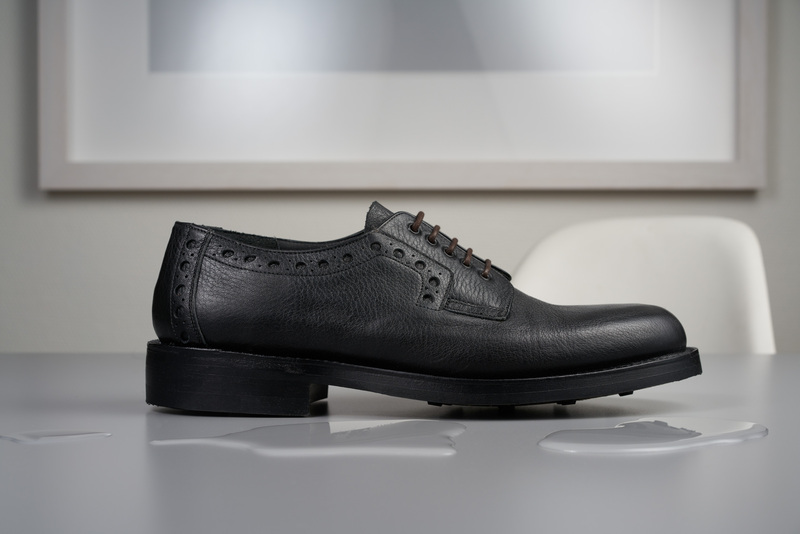 And that was the challenge they set out to solve, creating footwear that was both appropriate for a gentleman, and capable of dealing with rain. 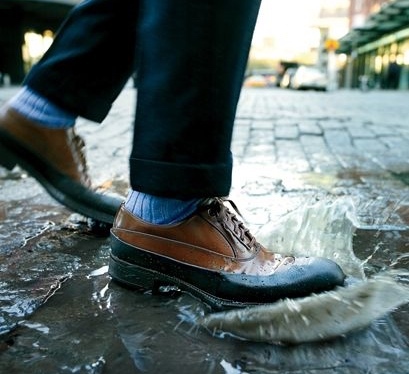 Not replacing the rubber wellie, mind you, but something that would cope with wet conditions significantly better than your traditional leather shoe. The result also had to be an attractive show, and be just as wearable as a regular leather shoe. 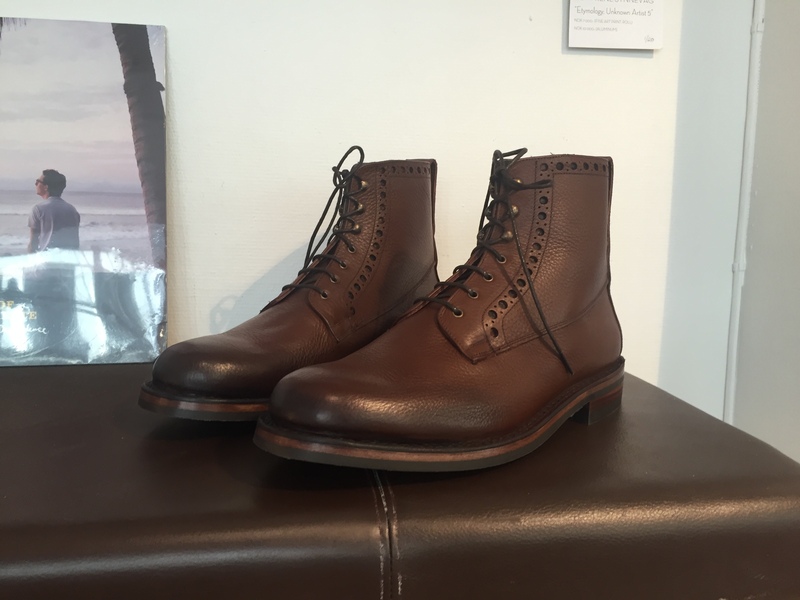 Having stood shoulder by should with Tim Little and the Grenson lads at trade shows it was natural to take their ideas there first. 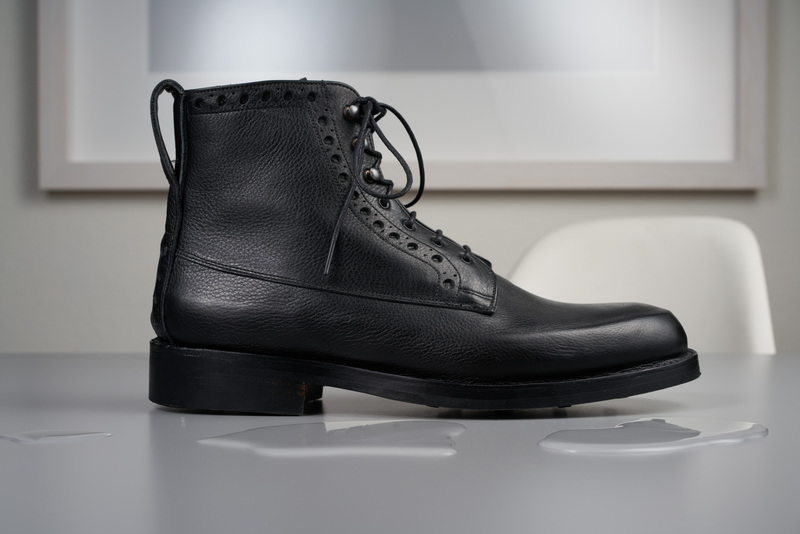 The guys at Grensons “Laboratory of Gentle Innovation” were intrigued by the idea and suggested that the Goodyear welt would do the trick, as per usual, squire. When informed that this would not actually do, as 150 odd years of dashing through rain with damp feet has proven, they had to actually start thinking new ideas. The problem is the stitching and how it flexes when the shoe is worn. Whenever the bends, the stitching allows air to flow in and out. Not much mind you, but as the same applies for water flowing in, we see the problem. 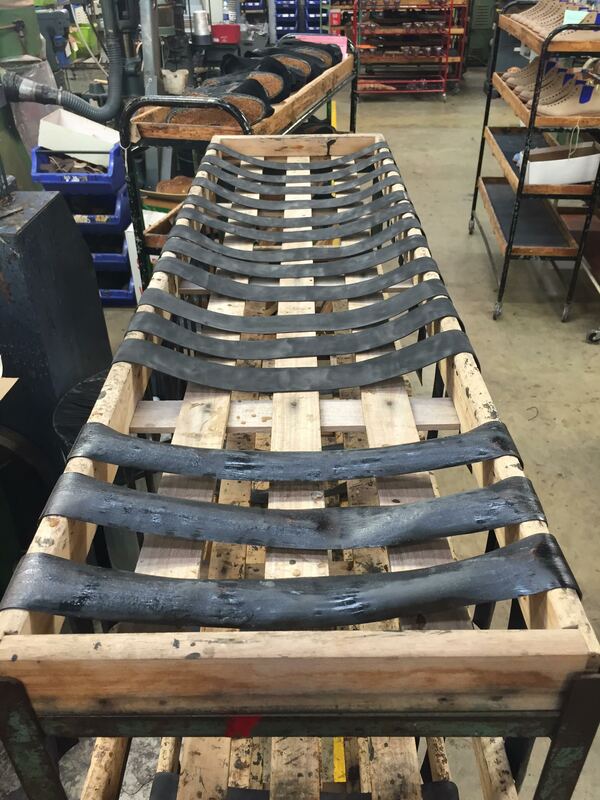 From the production line, the secret rubber ingredient! How to seal the stitches had the innovators stumped, until an unnamed young engineer was replacing the inner tube on one of his bicycle wheels and got thinking about how thin and flexible the inner tube was. To cut a longer story short, this proved to be the sparke of inspiration that led to the resulting innovation. By lining part of the inside of the shoe with rubber, and layering it along the stitching, a much more water resistant shoe was created. The leather uses is special as well. Given the environmental issues of chrome and vegetable tanning, there is a EU-funded project running to find an alternative method of tanning. 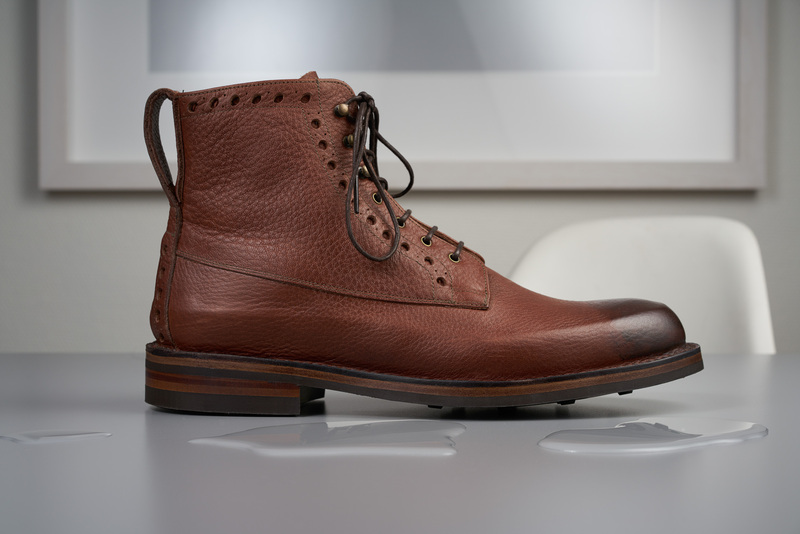 This project has come up with titanium tanning, which in addition to sounding incredibly badass has the benefit of giving both a superb quality leather and being much less damaging to the environment. An almost finished selection of shoes. From an engineering aspect I adore tales like this. A seemingly impossible task solved by smart thinking (and a little luck). From a sartorial aspect I think they’ve come up with a fine looking pair of shoes and boots as well. The usual Grenson quality and sturdy Dainite soles should mean they last for many years. And I’m certain the keen cyclist at the Grenson labs will have a fresh inner tube ready for the day you require a resole. Granted, not as cheap as a pair of wellies, but then that was never what they set out to do. And the production is pretty limited as well. Available now in brown and black, shoes and boots from the Norwegian Rain shops in Oslo, Bergen and London, and online at any moment. I’ll take mine in brown, thank you very much. Any idea where to get these online please? As far as I know they are currently only available in the shops, and I only know with certainty that the Oslo shop has them. I would drop Alexander a mail to check. They didn’t make many pairs though! Indeed, the release party was last night.